When Thanksgiving has passed and the leaves are off the trees, the harried modern person looks to the winter holidays like someone slumped across a railroad track contemplating an oncoming train. Laurie Colwin was a well known novelist by the early 1990s, when she began writing a series of columns for Gourmet. Their irresistible combination of food writing, memoir, and life advice made her immediately beloved by Gourmet’s readers, including me. She was funny, opinionated, personal, and, most of all, forgiving. She wrote about simple, delicious food that could be flung together easily by a frazzled cook. She also told wonderful stories about bad food: kitchen experiments gone awry (a pudding that tasted like “lemon-flavored bacon fat”) and repulsive dinners (“There is something truly triumphant about a really disgusting meal.”). Several of the recipes — fried chicken, tomato pie, creamed spinach, gingerbread — were instant sensations that are still kept in many cooks’ clipping files. The Gourmet columns are collected in Home Cooking: A Writer in the Kitchen and More Home Cooking: A Writer Returns to the Kitchen. The second book was published after Colwin’s untimely death in October 1992. … for those of you who are suffering from sadness or hangover, or are feeling blue or tired of life, if you’re not going to read Persuasion, you may as well read Italian Food by Elizabeth David. Or, better yet, read Home Cooking by Laurie Colwin. Check the WRL catalog for Home Cooking. I was up late, reading The New Annotated H.P. Lovecraft, and needed a snack before turning out the light. Lovecraft is heavy going, so I wanted something to restore my spirit: a grilled cheese sandwich. I found some Cabot’s Extra Sharp, bread, and butter, and fired up our trusty SuperLectric waffle iron. A few minutes later, the hideous excrescences of Lovecraft’s imagination were forgotten as I ate my hot, crispy, perfectly melted, dimpled grilled cheese. Will it Waffle? has rocked my world. The waffle maker, which I used to haul out of storage on rare Sunday mornings, now lives in the middle of the kitchen counter, an essential part of my batterie de cuisine. It glorifies sandwiches, hash browns, fruit, and other things that I’d never thought to use it for. Right this very minute, I am thinking about trying waffleized churros for breakfast tomorrow. 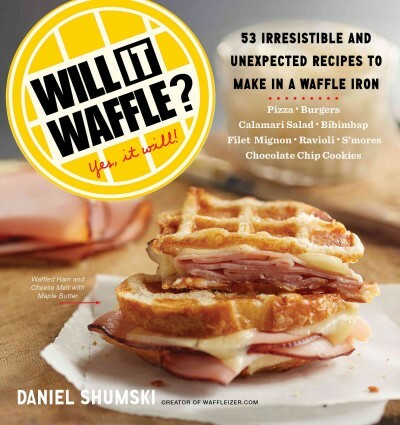 Daniel Shumski is the genius who thought to ask, “What can I cook in a waffle iron besides waffles?” For several years, he has been blogging about his experiments in waffling, and Will It Waffle continues the project with a collection of 53 recipes. Any dish that is meant to be hot and crisp is better when cooked in a waffle iron — thanks to all that additional surface area. Ergo, waffled bacon, falafel, leftover mashed potatoes, macaroni and cheese, and stuffing. These are actually some of Shumski’s less daring dishes. If you’re a thrill seeker, try throwing a soft-shelled crab or cookie dough into your waffle maker and see what happens. The book includes a short list of foods that won’t waffle, such as soup and drinks. Beyond these liquids, almost anything goes. There’s even a section where readers are encouraged to document their own waffle experiments. The message is clear: play with your food. Check the WRL catalog for Will It Waffle? We round out Batman Week with Penelope’s review of the other Batman TV show.—Ed. There is joy in Gotham! After decades of legal wrangling, the 1966 Batman TV show is finally coming to home video in November. Starring Adam West and Burt Ward as the Dynamic Duo, the series achieved pop-culture immortality thanks to its campy style and viral catchphrases, which need not be repeated here. Confession: Adam West was my first Batman. I still love the show, but the parody wears thin, and Batman is a Batusi-dancing buffoon. 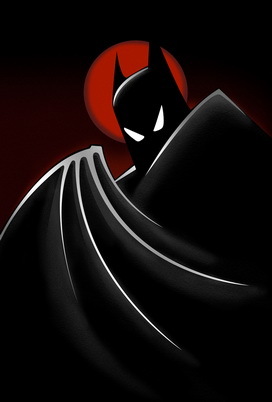 For a more artistic and complex Batman experience on the small screen, I recommend that you turn your eyes and ears to Batman, The Animated Series, which aired on Fox in the 1990s. 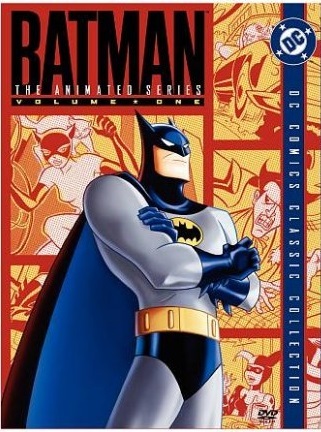 The Animated Series was created by actual comics artists and writers, while the live-action series was not. It is stunning to look at. Don’t take your eyes off the screen, because you are bound to miss something beautiful. The 40s noir atmosphere is enhanced by the use of black backgrounds, against which Batman’s eyes are nothing more than white slits. Lead artist Bruce Timm’s characters are drawn with stark angularity: Batman’s jaw is literally square. The storytelling is just as strong. The characters, especially the villains, are developed as real people who talk, feel and act like adults. This was not at all the norm for a kids’ cartoon show, which is how Batman was marketed. Take the Emmy-winning episode “Heart of Ice,” written by Paul Dini. Underneath his refrigerated suit, the seemingly emotionless villain, Mr. Freeze, is a grieving husband bent on vengeance. Woven into this dramatic story is a humorous and clever side plot: After being blasted by Mr. Freeze’s ice gun, Batman catches a cold, which Alfred treats with chicken soup… and if I told you what happened to the soup I would spoil the joke, so I won’t. Have you watched The Shining? Did you notice the placement of cans of Calumet Baking Powder in the hotel pantry? The disappearing chair, the impossible window, the reversal of the hexagonal carpet pattern? Danny’s hand-knit Apollo 11 sweater? If you’re like me, you were too busy recoiling from scenes of ax murders and blood gushing from elevators to pay attention to the carpeting. But for some obsessed fans, every piece of set decoration, every line of dialogue, every camera shot in The Shining is a potential clue to the film’s hidden meaning. Stanley Kubrick’s 1980 horror classic, adapted from the Stephen King novel, is ostensibly about a family isolated in a haunted mountain hotel while the father (played by Jack Nicholson) gradually becomes murderously insane. But Kubrick included so many weird scenes and omens not found in the book that an entire subculture grew up around analyzing and interpreting the film. 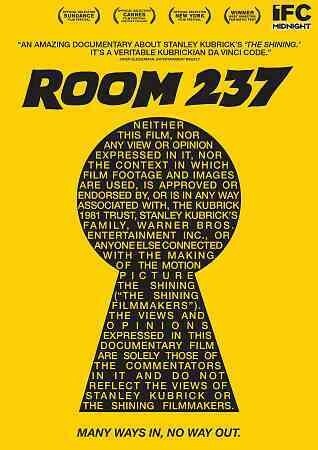 Room 237: Being an Inquiry into The Shining in 9 Parts is a documentary narrated by five members of that subculture who are convinced that they have cracked Kubrick’s secret code. Is the Calumet baking powder can a reference to the massacre of American Indians? Are a German typewriter (which changes color!) and the number 42 signs that the film is about the Jewish Holocaust? Do you have to run the film backwards to find its true meaning? Or perhaps the whole thing is a cloaked confession by Kubrick that he was involved in faking the video of the moon landing. Room 237’s director, Rodney Ascher, found an unusual and rather brilliant way to tell his story. We never see the five narrators; we just hear their voices expounding their various theories. The visuals consist almost entirely of thousands of movie clips—from The Shining, naturally, but also from Kubrick’s other movies as well as a huge number of familiar Hollywood films. Beatles or Stones? Yes! This fall, about 50 years after the founding of the two bands, we’re seeing a new crop of books about their early years, including Tune In, the first volume of Mark Lewisohn’s planned mega-biography of the Beatles, and Beatles vs. Stones, a historian’s look at the public images of the two groups. But I doubt that any book published this year will have the impact, or the sales, of Keith Richards’s autobiography, which came out in 2010. Life has to be one of the best books ever about the cultural and political explosion that happened in the mid 1960s—witnessed from the epicenter by a kid who just wanted to play blues guitar and ended up a pop superstar in the Rolling Stones. The book is raw and rude. 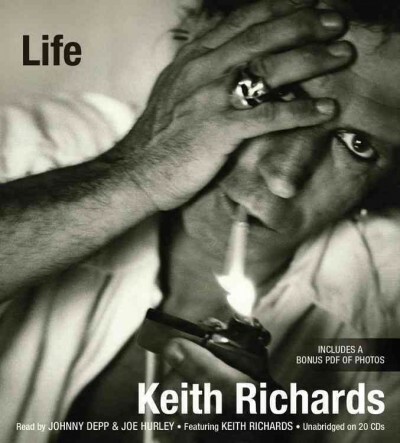 Keith disses a lot of well known people, and reveals without apology the depths of his bad behavior: the groupies and girlfriend-swapping, the endless hard drugs and booze, the arrests and trials, the wild parties and trashed hotel rooms. Fortunately, Keith is just as revealing about his music, documenting how he created his epic guitar riffs, and almost effortlessly wrote hit song after hit song with Mick Jagger. He has collaborated with everyone who is anyone in music, and tells good stories about his encounters with Muddy Waters, Chuck Berry, Little Richard, George Jones, Tom Waits, and many others. If possible, don’t read Life in print; listen to the audiobook version instead. Its offbeat, somewhat laid-back production is oddly suited to the story and to Keith’s distinctive style. There are three narrators, each taking a turn at reading in the voice of Keith : Johnny Depp (a close friend and admirer of Richards), the Irish rocker Joe Hurley, and Keith himself. This is disorienting for the listener, since the narration switches without warning from Depp, reading quite neutrally in his American accent, to Hurley, who does an over-the-top interpretation of Keith: slurring words, chuckling, and mumbling in a South London accent. At first I was put off by Hurley’s reading, but it grew on me and eventually I settled in to enjoy it. Keith narrates the final section of the book, covering his recent years, which are comparatively uneventful—oh, except for the time he fell out of a tree in Fiji and suffered a life-threatening brain injury. What a drag it is getting old… For years now, the Stones have endured writings in the press making fun of their withered appearance and calling on them to retire, for decency’s sake. So far, neither the band nor their fans are ready to pack it in. In the summer of 2013, the Stones rocked out in electrifying sets in Hyde Park and at the Glastonbury Festival before screaming crowds spanning three generations. You know what they say, baby: listen to your elders. When I was growing up in northern New England, I used to try wild apples. They could be found in the countryside and even deep in the woods, still growing in orchards abandoned 50 or 100 years before. Quite a few of these apples were “spitters,” but the good ones spoiled me for any supermarket commodity apple. Amy Traverso’s book made me remember those old orchards, which are stark evidence of the collapse of diversity in American apple growing. One hundred years ago, about 15,000 named varieties of apples were grown in North America. Today, most of them are extinct. Apple preservationists are working to reverse this trend, and thanks to their efforts, you can now buy heirloom varieties such as Black Oxfords, Roxbury Russets, and Yellow Transparents at farmers’ markets and specialty orchards. But what to do with them when you get them home? The Apple Lover’s Cookbook has it covered. The heart of the book is a detailed guide to 59 apple varieties, all of which are currently grown somewhere in the country. Each type of apple gets a glamorous photo along with information about its history, best uses, availability, appearance and taste (e.g., “flavors of honey and pear” or “sweet, rich and spicy, with a mild aroma of cilantro”). The usual supermarket suspects are here, but never mind them. The fun is in learning about and desiring varieties that you have never heard of, with evocative names like Westfield Seek-No-Further, Esopus Spitzenburg, or Calville Blanc D’Hiver. The most useful and clever thing about the guide is that each variety is assigned to one of four categories based on its taste and texture: firm-tart, firm-sweet, tender-tart or tender-sweet. Most of Traverso’s recipes call for apples by category, not by name, so you can use a supermarket apple or an heirloom, as long as it’s from the right category. However, if you’re just cooking with Granny Smiths, you’re missing the point. This is probably the place to confess that what first attracted me to this book was a photograph of a doughnut. The beautiful pictures of dishes such as Apple-Stuffed Biscuit Buns, Dutch Baby, Apple and Mustard Grilled Cheese Sandwiches, and Pork and Apple Pie with Cheddar-Sage Crust will have you searching the kitchen junk drawer for your apple corer. If this book has a hero, it is the Maine apple historian John Bunker, profiled in one of the brief articles scattered among the recipes. The story of how he tracked down and rescued the last known branch of Marlboro apples in existence is downright inspiring. In honor of people like him, don’t buy that pretty but soulless Red Delicious the next time you visit the supermarket. Put it back down, and see if you can find a Baldwin, a Gravenstein or a Northern Spy instead. Anthony Trollope’s fictional heroine, Bell, likes just the sort of book that Trollope himself wrote, clear as running water. After his death, Trollope’s reputation was that of a writer of light fiction lacking in plot and literary style. Now the literary tide has turned, and he is praised as a master of realism. Whereas his great contemporary, Dickens, gives us a three-ring circus of grotesque and absurd characters in every chapter, Trollope writes of ordinary people who are neither all good nor all bad. They talk and gossip as ordinary people do—about their gardens, politics, who is engaged to whom—and their characters and feelings are subtly revealed in these everyday conversations. Which brings me to Timothy West. I love reading Trollope in print, but I can understand why some people fault his prose as boring or flat. Not until I listened to his novels performed on audiobook by Timothy West did I fully appreciate the glory of Trollopean prose. The man was born to read Trollope, and Trollope was born to write novels to be read by Timothy West. 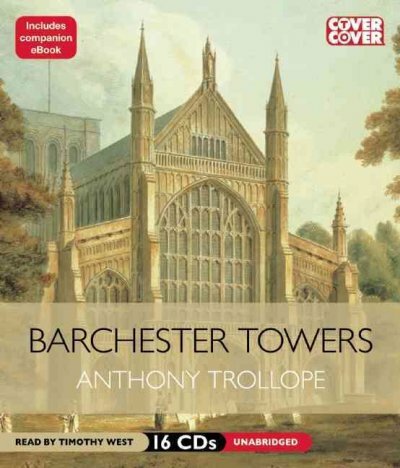 If you have not read Trollope before, I recommend starting with Barchester Towers, the second of Trollope’s six Barsetshire Novels, even though it alludes to events in the first book, The Warden. It is Trollope’s best-loved novel, and for good reason. The great question that touches all others in the story is, who will rule the diocese of Barchester: the vain but cowardly new bishop, Dr. Proudie, his terrifying wife, Mrs. Proudie, or his sanctimonious chaplain, Obadiah Slope? Entertaining events ensue. All of the many characters are guilty of human weakness or bad judgment—yet their failings and moral dilemmas are treated with humor and (for the most part) forgiveness. West voices the characters perfectly. He is especially superb as the narrator, who is continually making witty asides to the reader. Sadly, there is no real Barsetshire. Trollope is said to have taken his inspiration for the cathedral city of Barchester from the real Salisbury in Wiltshire, and his country locales from various places in England’s West Country. But though Barset exists only in the imagination, there is no more pleasant place in the world to spend a few quiet hours.